I recently helped a friend diagnose her RO system for low output. Since I took a few pics in the endeavor I thought it would be time to post the information. 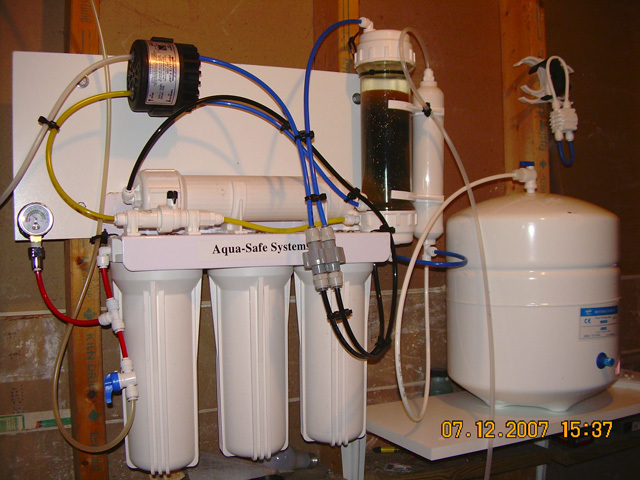 Her home use system uses a captive air tank whereas systems designed for aquarium use will not. The captive air tank results in a drop of efficiency as the tank fills, but the troubleshooting is basically the same. The vast majority of RO issues are a direct result of inadequate inlet pressure. Ideally we want at least 60psi at the membrane inlet. Pressures less than 40-45psi will cause poor performance, prefilter and membrane life. My system has been over 100psi with no seal issues. Step 2. Isolate captive air tank but shutting off valve located on top of tank. Step 3. Remove tubing from inlet of prefilter stage one and install pressure test gauge as shown. Step 5. Turn on supply water; measure pressure as shown and record data. 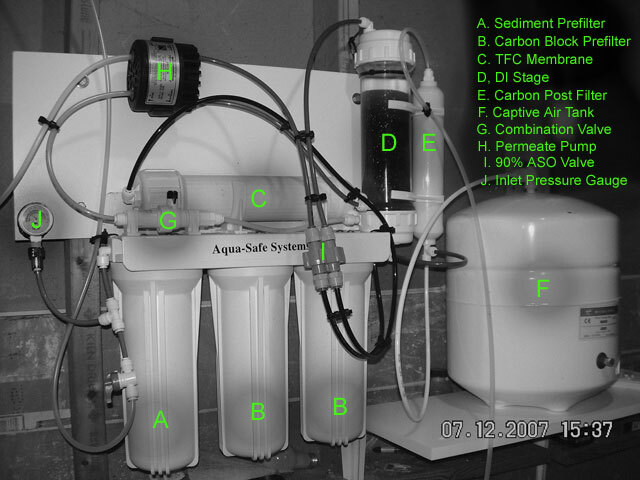 This test is used to determine the serviceability of your prefilter elements. Ideally, the maximum pressure differential should be no more than 5psi. Real world might allow slightly higher if the outlet of the prefilters is still above 45-50 psi. The prefilter outlet dynamic pressure on my system is 67psi. This indicates my prefilters have pressure drop of 6psi (inlet-outlet). My prefilters have seen quite a bit of use (9 Months) and are due replacement as confirmed by this test. Note: Most captive air tank systems will need more frequent filter replacements under the same level of use. I use a device called a permeate pump that eliminates a design inefficiency most captive air tanks systems have. This design inefficiency decreases the pressure differential across the membrane and increases the brine rate as the tank fills. This test is used to measure the ratio of waste water to permeate (RO) water. Step 2. Remove waste water (brine) line from house connection and run line to a water jug. Step 3. Open RO system outlet and collect 1 cup of permeate water. Step 4. Compare the amount of waste to the amount of cleaned water. Membrane manufacturers recommend a brine ratio of 3:1 or 4:1. The brine water flows across the surface of the membrane. This flow is what keeps the majority of the contamination from clogging up the membrane. Membrane age and pressure issues can result in this ratio being excessive. Note: The system has a flow restrictor on the waste side of the membrane housing. This restrictor is sized based on membrane flow rating and is responsible for the required pressure differential across the membrane. If the brine ratio is too low, chances are the restrictor is incorrectly sized for the GPD rating of the membrane. I prefer a slightly lower ratio to gain more prefilter life. The rejection ratio is a comparison of the membrane inlet TDS to Membrane outlet TDS. It is important if your system is equipped with a DI stage that the measurements be taken before that stage. Rejection ratio is highly dependent on pressures, membrane condition, rejection ratio, and even water temperature. New membranes under ideal conditions should have a rejection ratio of 95% or better. Personally as long as my rejection ratio remains constant, 90% is ok.
My system has an inlet TDS of 220ppm and a system outlet of 18ppm. (220-18)/220= 91.8% rejection ratio. Last edited by Av8tor1; 08-15-2015 at 03:18 PM. These procedures should identify the vast majority of common RO issues. There are other problems that occur I've chose not to go into. These are very uncommon in comparison and better dealt with on an individual basis. It is always a good idea to run these test when replacing the membrane and pre-filters. They will give you benchmark values for comparison use later. Last edited by Av8tor1; 08-16-2015 at 07:41 PM.